HONOLULU—With support from the Hawaii Technology Development Corporation (HTDC), Tridentis Advanced Marine Vehicles (AMV) launched in Kona last November to continue its development of the world’s most advanced autonomous and unmanned marine vehicles, working with the National Oceanographic and Atmospheric Agency (NOAA). Tridentis AMV is a wholly owned subsidiary of Tridentis, LLC, a national technology company founded in Virginia. HTDC awarded the company with a Hawaii Small Business Innovation Research (HSBIR) grant to help accelerate the technology needed to create the advanced marine vehicles. The company also received mentorship from HTDC’s Neighbor Island Innovation Initiative (NI3), which provides technical and business assistance to small and early-stage tech companies on neighbor islands. With its new location, Tridentis AMV is creating local jobs and recently hired Wayne Dahl as a senior control engineer to oversee design and software execution. Previously, Dahl worked to develop software for the Keck Interferometer and most recently worked as a process control engineer for a local tech startup. Tridentis AMV is also hiring engineers with experience in unmanned and autonomous vehicles, specifically those with expertise in sensors, artificial intelligence, controls, battery systems, robotics and imaging. 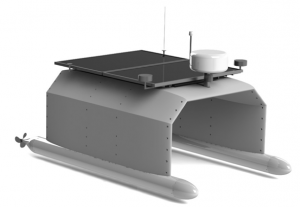 The company is designing an unmanned and autonomous marine vehicle to leverage a variety of sensors that can capture a range of data, including water quality, coral reef color, temperature, and other environmental features. NOAA will use the unmanned and autonomous marine vehicles to test water quality and monitor threatened coral reefs. Hawaii’s Small Business Innovation Research (HSBIR) grant program invests in the state’s tech and innovation sector, bringing in about $20 federal dollars for every $1 invested by the state. The program is intended to create high-paying jobs and further the local technology industry, as is currently being demonstrated on the Island of Hawaii. Kona offers an optimal setting for Tridentis AMV. With their new headquarters at the Natural Energy Laboratory of Hawaii Authority (NELHA), Tridentis AMV has access to sustainable energy start-ups, air transport facilities at Keahole Airport and the Hawaii Ocean Science and Technology (HOST) Park, an ideal environment for testing marine vehicles. Jochum is looking to further expand Tridentis AMV and make Kona the global center for unmanned and autonomous marine vehicles. HTDC is a state agency, attached to the state Department of Business, Economic Development and Tourism (DBEDT). HTDC’s mission is to facilitate the development and growth of Hawaii’s high technology industry. HTDC is providing capital, building infrastructure and developing talent to foster innovation and diversify Hawaii’s economy. HTDC’s 80/80 Initiative is to create 80,000 new tech and innovation jobs that will provide high paying jobs for Hawaii residents. Tridentis, LLC is a professional engineering, logistics and program management firm founded in 2006 that is focused on providing services to the Department of Defense, United States Coast Guard, Military Sealift Command, NOAA, U.S. Army Corps of Engineers, allied foreign militaries and a variety of other federal agencies and commercial customers. They are a registered small business headquartered in Washington, D.C., with additional offices in Baltimore, MD, and Norfolk, VA, which gives them the unique ability to provide customers with quick access to personnel with diverse technical backgrounds.